To prepare barbecue sauce, combine brown sugar, beer, mustard and vinegar in small saucepan; bring to a boil. Reduce heat and simmer 15 to 17 minutes until thickened and reduced in to 1/2 cup, stirring occasionally. Lightly shape Kentucky Cattlemen's Ground Beef into four 1/2-inch thick patties. Place patties on grid over medium, ash-covered coals. Grill, covered, 8 to 10 minutes (over medium heat on preheated gas grill, covered, 7 to 9 minutes) until instant-read thermometer inserted horizontally into center registers 160°F, turning occasionally. About 2 minutes before burgers are done, place bun, cut sides down, on grid. Grill until lightly toasted. Spoon 1 tablespoon sauce on bottom of each bun; top with burger. 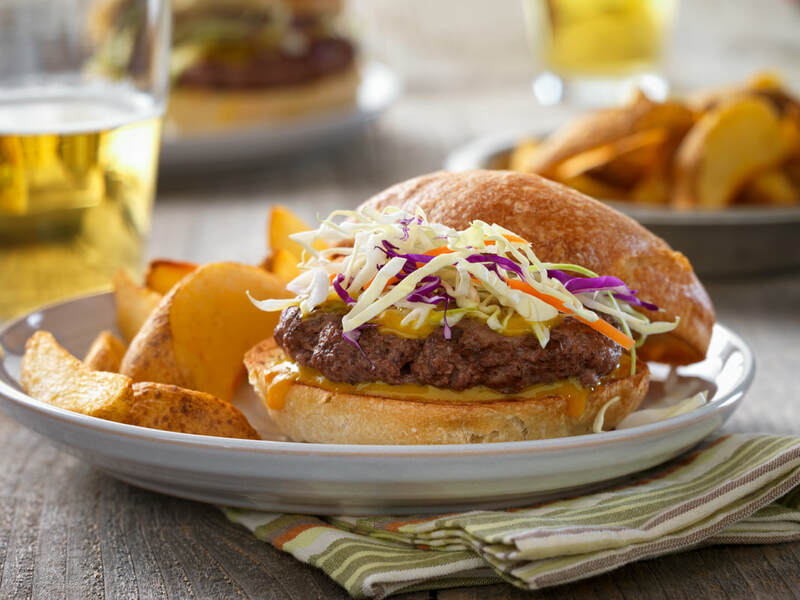 Evenly top burgers with cabbage. Evenly spoon remaining sauce over cabbage. Close sandwiches.